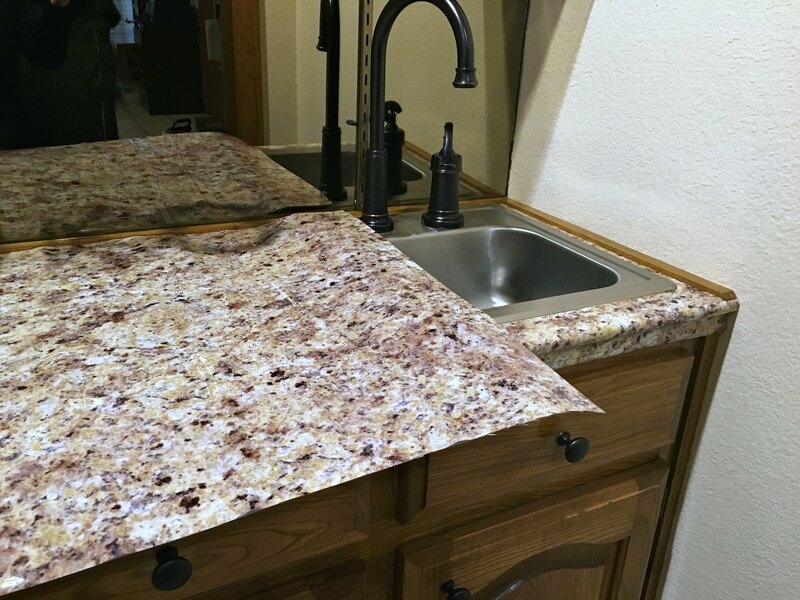 So you want to update your countertops from laminate to granite, but don’t want a big job or the expense of what granite costs. What to do? 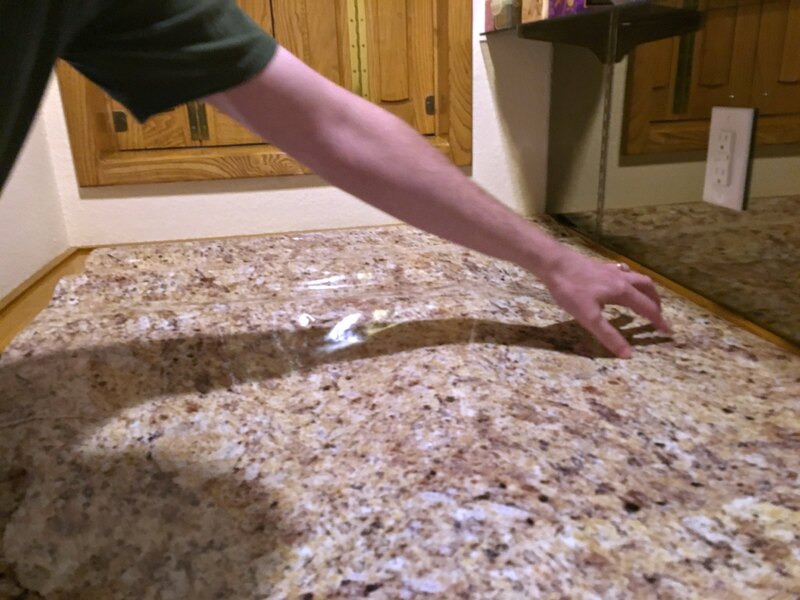 A fake granite counter just might be your answer! 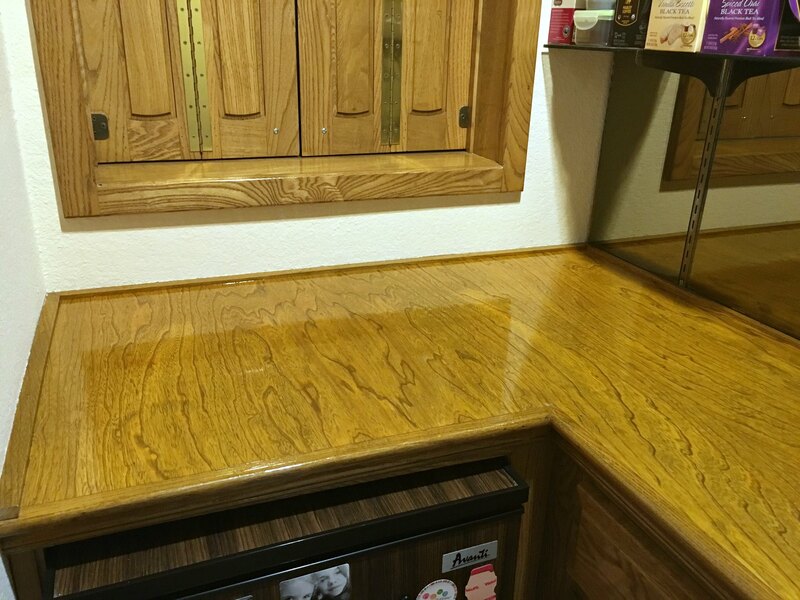 Our house is 28 years old and while the previous owners did some upgrades there are still plenty more to do 🙂 They replaced the kitchen countertops with granite, but the wet bar in the den area had old varnished wood counter tops. When InstantGranite.com asked if I’d be willing to do a review of their product I was intrigued by the fact that we could update that wet bar area to look like our kitchen but without the mess or cost of putting in real granite. I watched their videos, some TV spots on major shows (like Rachael Ray) and decided that we’d try it out and if we failed at it, then we’d just bite the bullet and replace the counter. 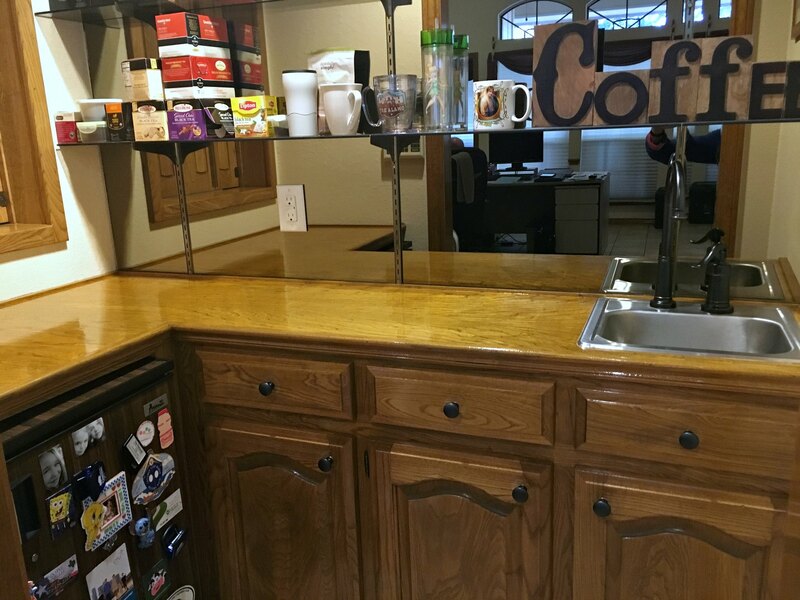 Our wet bar is actually a pretty small area, the countertop measures about 18″ x 6′. 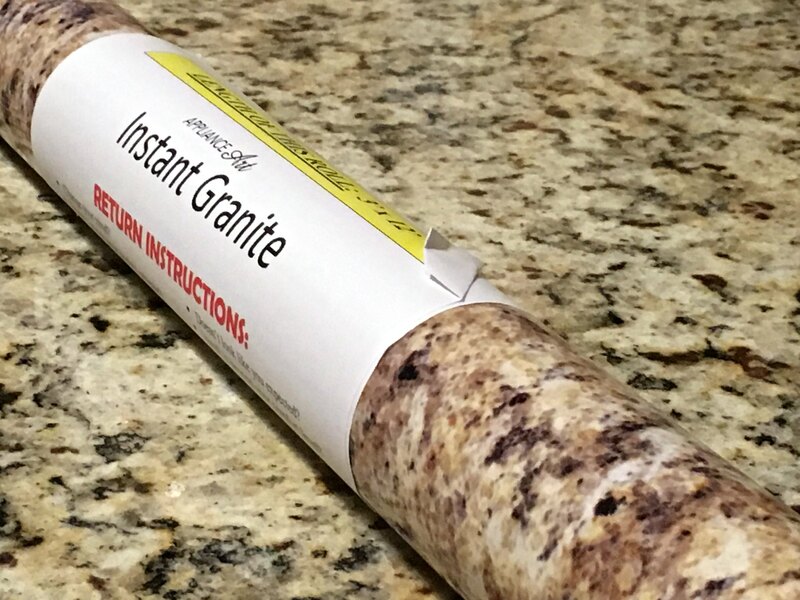 Instant Granite sent us a 3′ x 12′ roll of their adhesive film to complete the project which was more than enough (we actually have some leftover that my husband plans to use on the counter around our sink in the garage). Before beginning the project of laying the Instant Granite film down we made sure to read all the instructions and watched a few videos on installation, and then we were ready to get started. The roll was just not the right length or width that we could do the entire countertop without splicing and we wanted to try applying a small portion first before we committed to laying the entire film down. So we cut a small piece where we needed to splice and started applying. With that piece done, we went on to do the rest of the countertop. The videos make it look so easy. And while it isn’t hard, I don’t really think it’s a one person job either. I did have to be an extra pair of hands on more than one occasion. But essentially all you do is measure (twice! remember that rule – measure twice, cut once! 😉 ), cut (leaving some excess for wrapping edges etc. ), then starting at one side peel a little of the backing off, align it get as many of the bubbles out and then continue slowly peeling the backing off as you smooth out the film with the included smooth edge tool that comes with the product. I do wish that would have been a bit larger, it was a bit tedious due to its size. When that’s all done, your trim it to wrap around your counter edge and blast it with some heat so that it shrinks a little and molds to the edging. We did staple where we could underneath just to make sure it didn’t lift at all. I have to honestly say this Santa Cecilia granite pattern is very forgiving, it’s hard to see where we spliced the pieces together unless you look really closely. 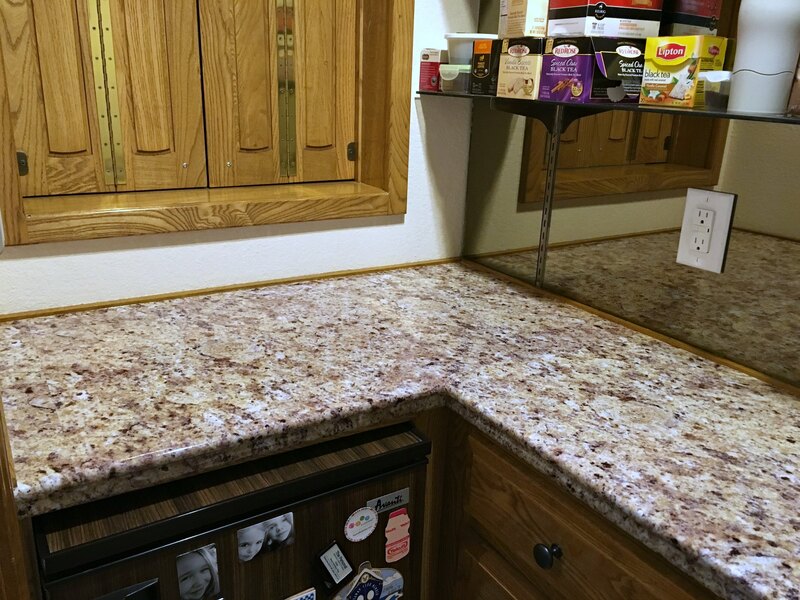 Also our countertops weren’t square, so we ended up having some edges that were showing the original countertop. We simply patched some pieces in, and you can’t even tell. This particular pattern matches our real granite kitchen countertops quite well (the above photo is the roll before opening on our kitchen counter), so when just walking by the wet bar, or even just standing nearby no one would probably be the wiser that it isn’t real granite. When I showed my friends some pictures they couldn’t believe it was just vinyl film and not real granite. Sure up close it’s apparent it’s not, but let me tell you it looks a whole lot fresher than my nearly 30 year old wood counters did. Great post. I love granite countertops, but I haven’t had the funds to invest in them. This seems like a good compromise. I wonder, though, is the illusion ruined as soon as someone touches or knocks on the counter? Does it just feel like wood with wallpaper on it? Thanks for sharing! I’ve never seen this done before, and I really like it! I really love the look that granite can bring to a room, so I’m happy to learn that I can still get the look! I can’t wait to give it a go, so thank you very much for this help! Those counters look great! You can’t even tell it’s vinyl from the pictures. What an upgrade from the old wood countertops! There are so many affordable options for kitchen countertops and they all still look nice. where can I purchase this instant Granite in Canada? Monique my advice would be to go to the website and contact them directly from there. Since I received this as a review item I didn’t actually purchase it and I don’t know where/if they distribute it in Canada. How did you manage around the sink? Did you pop it out or just work carefully around it? This looks nice, I would never have known it was a vinyl film. Any problems with tears or knicks from something sharp on counter? 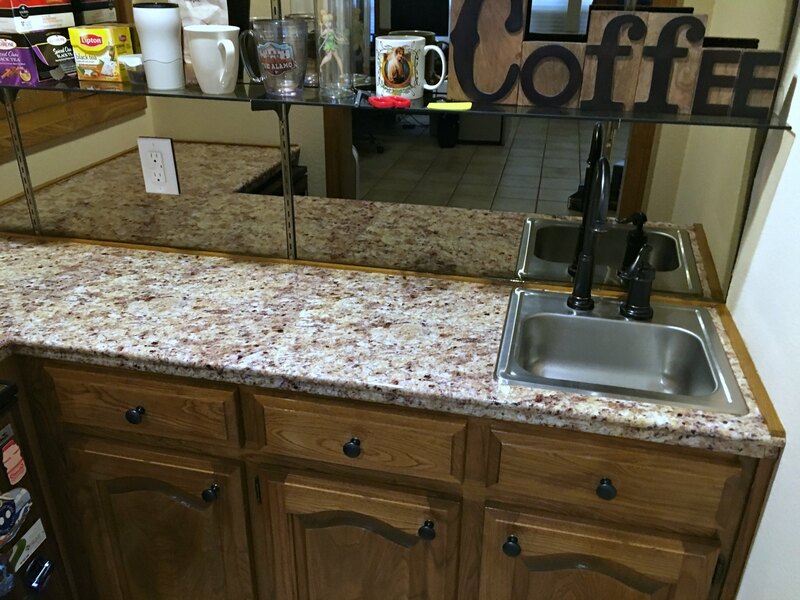 We haven’t had any issues yet, it’s still holding up fabulously after nearly 2 years – however, it is our coffee/wet bar countertop, so we are not using it to cut on or having everyday dishes on it either.